Peat is a living mass and many factors affect its performance. The consolidation and settlement due to new and existing roads can usually be predicted but other effects, e.g. adjacent drainage work, an unusual dry summer, a change in the water table in the peat, etc can also occur over which the engineer may not have control. These future events are unlikely to be known at the time of road design or construction and as a result the behaviour of roads on peat can never be fully assured over the longer term. Lateral displacement: Lateral movement caused by shear stresses in the soil when a load is applied. The magnitude of the movement increases with lower factors of safety (cf Chapter 5.2). Settlement: The vertical change of the surface of a soil mass when a load is applied, e.g. a road or building. The settlement would be the sum of the compression and effects from lateral movement. a) Slowly, with gradual consolidation and compression allowing time for the peat mass to respond to the load. This is the desired method for constructing a road on peat and allows time for the peat to improve its strength and bearing capacity. b) Rapidly, without a change in volume, with rapid spread and shear of the peat causing failure. Peat is highly vulnerable to ‘shear overstress’ and loadings need to be carefully controlled to keep stresses within the available strength. In the normal course of events the consolidation, compression and settlement of peat may be considered as taking the form of three phases, ‘instantaneous settlement’, ‘primary consolidation’ and ‘secondary compression’. A fourth phase “tertiary settlement” is also mentioned by some sources and is considered also. Consolidation Behaviour of Peat. Graph showing the 4 stages of consolidation and settlement of peat under load such as a road embankment. Read the stage descriptions (a, b, c, d) from below. Elastic or “instantaneous” settlement takes place immediately a load is placed on the peat, but this is usually ignored in the monitoring of consolidation as it is almost impossible to measure. It is shown however as a theoretical initial settlement of 0.05m at the commencement of the time-strain graph below. Peat is very permeable in its natural state and the magnitude of the primary settlement, or “primary consolidation”, under a controlled load is normally large and the period of settlement short, usually days. During this initial loading phase the new load is taken up by the free water and peat skeleton within the loaded peat. As the peat resists the load the vegetal structure compresses and strengthens, and a portion of the load is transferred back to the free water causing a localised increase in the pore water pressure. This pressurised pore water in turn finds release into the adjacent unloaded peat causing the load to be taken up again by the peat mass with further settlement, and strength improvement and load transfer. Normally the ‘primary consolidation’ process takes place within the time it takes to place a road embankment layer, and its magnitude is dependant on the weight of the embankment and the thickness of the peat deposit, and any other compressible layers involved. In the “secondary compression” phase the load on the peat continues to be further transferred from the water within the peat to the internal peat skeleton as the peat mass continues to respond to the applied load. This secondary phase is generally accepted to be linear with the logarithm of time and the result of the loaded vegetable fragments within the peat mass slipping and re-organising to form a denser matrix. As these come together, and pore sizes close up, the permeability through the peat reduces in response. A “Tertiary settlement” phase for peat is also suggested by some authors whereby the rate of secondary settlement increases with the logarithm of time for a period until it vanishes. This is thought to be a function of macropores and micropores but it generally outwith what is usually considered for engineering design. 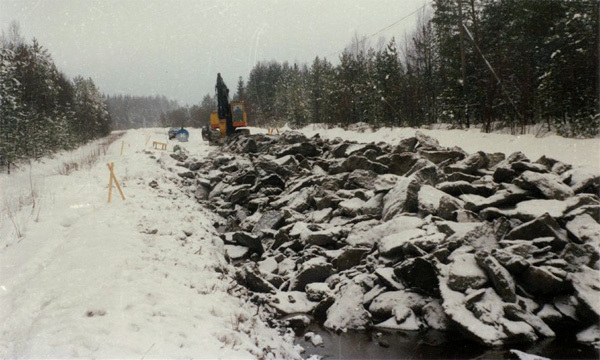 In case studies the lateral movement under the slope of an embankment is in the range of about 0.1 m. This movement will add to the settlements caused by compression of the peat. Normally the lateral movement occurs at early stages and mostly affects the soil beneath the edge and slope of the embankment. The settlement caused by lateral movements can be usually kept in control if the factor of safety is high enough. The descriptions of the four consolidation and settlement phases above are a very simple explanation of the complex processes that occur when peat is loaded. The amount of primary consolidation incurred at any location will vary with the type of peat involved but as a general rule of thumb would be around 50 per cent of the total settlement over time. Secondary compression and tertiary settlement are normally accepted to take place over a period of 30 years (or 10,000 days) for the purposes of road design. In all of the above it has to be stressed that a peat deposit must be loaded slowly in stages with waiting periods to permit it to consolidate and gain in strength rather than shear. If the load is applied too quickly to cause the peat to approach, or exceed, its insitu strength then catastrophic failure can follow. 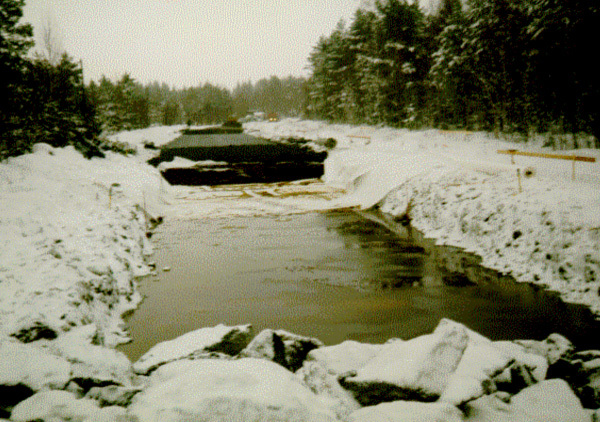 The construction of a floating road on peat is only possible if the ‘drained strength’ of the peat can be utilised. If the peat is loaded too quickly without allowing time for the build up of water pressures to be released it will only have its natural shear strength, ie which could be less than 6 kPa. This has to be avoided and road designers should be aware that serious shear stresses can be induced even by moderate fills if peat masses are loaded too quickly. Special arrangements are necessary when dealing with peat locations affected by seasonal frost, sporadic permafrost and permafrost. These types of soils bring their own considerations, and advantages and disadvantages. The positive side is that frozen sites are easier to excavate and fill but they can have unexpected settlements in late summer many years after when the frozen material eventually thaws. Unfortunately there is no way of predicting when this type of settlement will happen and will be the result of the particular circumstances at the time. Thawing of frozen ground occurs as a result of the heat from the sun being absorbed by the dark surface of the road pavement and moving down into the frozen layers. 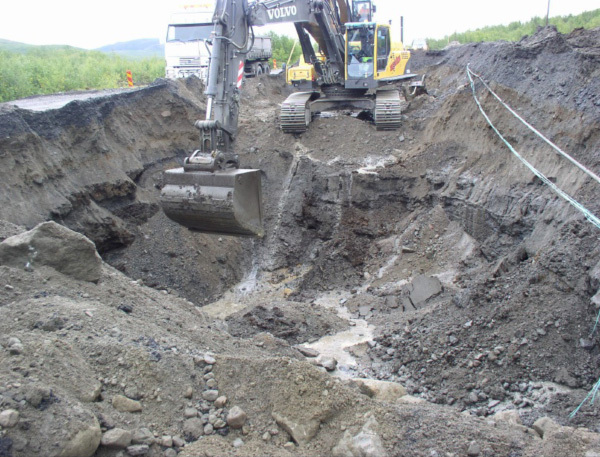 It is possible to build roads on permafrost but protective measures will be needed, such as installing insulation under the road, to prevent the underlying frozen material thawing.